Have you felt a calling to get involved in the church? Have you ever thought about joining the music ministry? Maybe you thought you weren’t good enough. Maybe you thought you didn’t know how you would fit in. Maybe you didn’t think your schedule would allow it. One voice can have such a huge impact on the worship experience. This is a great way to add further meaning to your worship experience on Sunday. Matt or Amy leading solo. This year we are changing the makeup of the worship leading experience to better use gifts and talents of the musicians involved (and those not yet involved…you) to provide the best experience during Mass. Many people think that you need training or the ability to read music, but that is simply not true. Surround yourself with other passionate people like yourself and make a difference. When Jesus called the disciples, he didn’t got to universities looking for trained men, he sought out ORDINARY PEOPLE to carry out his mission. YOU are one of those people that Jesus is calling to get involved. We are calling these our *Open Mic Sessions*. Open Mic Sessions are a great way to explore the different options of music involvement from singing on your own, to praise teams, and the church choir. Honestly, there is a place for you here. Just give it a chance. If you don’t feel that the music ministry is right for you, then you can still support the singing from the congregation. 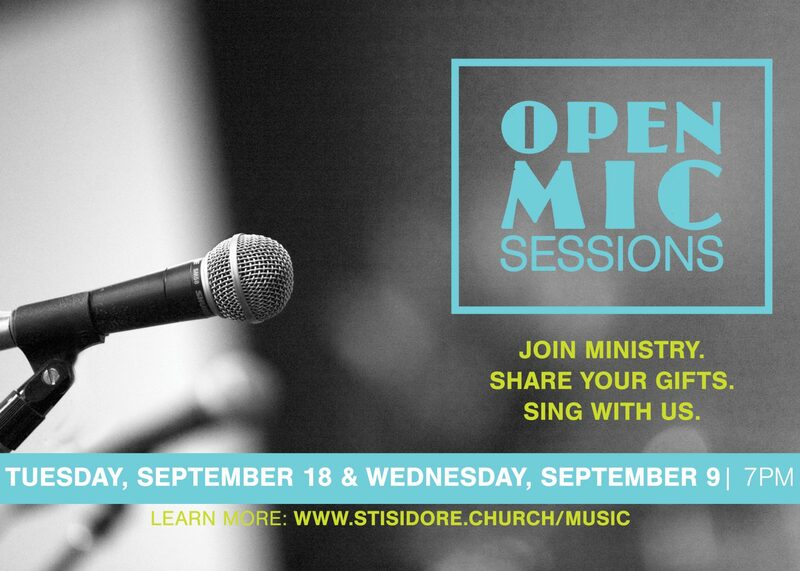 We are holding two Open Mic Sessions on Monday, September 18, & Wednesday, September 20 at 7PM. Meet and sing with people just like yourself and then hang around for some delicious cider and donuts. OK. Are you willing to give it a try? Tuesday, September 18 or Wednesday, September 19 at 7PM in the church.